LaDonna Ruth McCauley Stieferman McIntyre, 92, of Ponca City, Oklahoma, was born to William B. Johnstone, and Octavia L. Walker Johnstone in South Haven, Kansas February 4, 1927. She was one of 15 children. She was raised East of Newkirk, Oklahoma on a farm. She met Clyde Felix McCauley at a basketball game. They married in 1943. 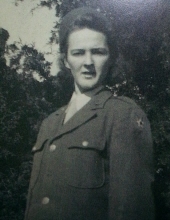 She was a mother of three sons, whom she raised through WWll. She loved fishing, crocheting, and baking. Several awards at the fair for her baking and crocheting were awarded to LaDonna. She loved working in her garden. As well, LaDonna served as an overnight caregiver to people who were cancer victims. She married Raymond P. Stieferman in El Reno, Oklahoma on September 4, 1973. They lived in Ponca City, Oklahoma. To send flowers or a remembrance gift to the family of LaDonna McIntyre, please visit our Tribute Store. "Email Address" would like to share the life celebration of LaDonna McIntyre. Click on the "link" to go to share a favorite memory or leave a condolence message for the family.